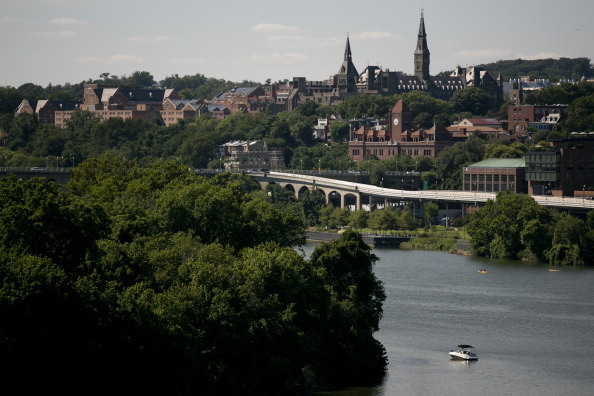 Georgetown University’s former tennis coach is among those indicted on a charge of racketeering conspiracy as part of a sweeping series of allegations of college admissions bribery and cheating. Gordon Ernst was the head men’s and women’s coach at Georgetown University for 12 seasons, leaving in 2018 to coach the women’s team at the University of Rhode Island. “Mr. Ernst’s alleged actions are shocking, highly antithetical to our values, and violate numerous university policies and ethical standards,” the letter added. Prosecutors said in a news conference Tuesday that parents nationwide paid Singer, who ran the consulting service The Edge College and Career Network (also known as The Key), a total of $25 million between 2012 and 2018 for a variety of services, disguising the payments as donations to Singer’s nonprofit charitable organization, the Key Worldwide Foundation. Singer would then use the money for a variety of purposes — generally cheating on SATs and ACTs, and falsifying athletic records — to get the parents’ children into elite schools. A charging document alleges that an applicant to Georgetown in 2015 indicated that she was ranked in the top 50 in the United States Tennis Association’s Junior Girls rankings for her sophomore through senior years of high school, and made the USTA All-Academic team in her last two years. The document says USTA records show she played no tournaments in high school. Ernst forwarded it to an admissions officer the next day with the note, “Potential spot,” the documents said. A few months later, the family sent a check for $400,000 to Singer’s foundation. The documents said one of Singer’s co-defendants had also taken the ACT for the daughter. Ernst received $700,000 from the Key Worldwide Foundation between September 2015 and August 2016, the indictment reads. The indictment naming Ernst also gives an alleged example from 2015: In August of that year, an applicant to Georgetown forwarded to Ernst an email that Singer had written for him, with false claims that the applicant was a competitive tennis player. A couple of days later, Ernst allegedly wrote to an admissions officer to “confirm my usage of three spots” for competitive tennis players. All three spots, the indictment says, went to Singer’s clients, including the applicant with the false claim. It’s not clear whether this indictment is referring to the same case. Around 50 people — coaches, test administrators and parents — nationwide have been named in indictments so far. Singer’s activities included paying people to take tests for students or correcting their answers afterward. Singer would advise parents to get their children diagnosed with learning disabilities so that they could have extra time to take standardized tests, including the SAT and ACT, and they could take them alone, with proctors Singer had bribed. Singer also arranged fake athletic profiles for students in order to enhance their value to universities, in some cases taking photos of students playing sports they didn’t really play, and Photoshopping children’s faces into photos of athletes. Parents then wrote letters falsely claiming that no goods or services were exchanged, which also allowed them to take tax write-offs for their payments, which prosecutors said ranged from $100,000 to $6.5 million, though most payments ranged from $250,000 to $400,000. Among the indicted include three people who organized the alleged scam; two SAT/ACT exam administrators; one exam proctor; one college administrator; nine coaches, and 33 parents. In one case, a former USC women’s soccer coach and a consultant allegedly worked together in 2017 to help a client’s child get into Yale in exchange for $1.2 million from the family. A false athletic profile created for the student said she played competitive soccer and had been on China’s junior national development team. Meredith is also named in an indictment as having solicited a bribe directly from a parent. Parents charged include actresses Felicity Huffman and Lori Loughlin, along with Loughlin’s fashion-designer husband, Mossimo Giannulli; Gordon Caplan of Greenwich, Connecticut, a co-chairman of an international law firm based in New York; Jane Buckingham, CEO of a boutique marketing company in Los Angeles; Gregory Abbott of New York, founder and chairman of a packaging company; and Manuel Henriquez, CEO of a finance company based in Palo Alto, California. Court documents say Huffman paid $15,000 that she disguised as a charitable donation. Court papers say a cooperating witness met with Huffman and her husband, actor William H. Macy, at their Los Angeles home and explained the scam to them. The cooperator told investigators that Huffman and Macy “agreed to the plan.” Macy has not been charged; authorities haven’t said why. In a statement Tuesday afternoon, prosecutors released a partial transcript of a phone call Singer had with a parent. He told another parent, “The number on the testing is $75,000. OK? It’s $75,000 to get any test scores you would like to get on the SAT or ACT.” He added that the parent needed for his daughter “to be stupid” when she was tested for a learning disability. In another case, Singer and a parent allegedly discussed a plan in July 2018 for her son to fly to Houston to take the ACT, but for one of the defendants to actually take it for him, unbeknownst to the student. Later, the parent says her son has been diagnosed with tonsillitis and has been advised against travel. She suggests her son take the test at home — “so that he would believe he had taken the test,” prosecutors said — while Singer’s accomplice takes the test for him in Houston. After the details are arranged, Singer says, “We are looking for … we are trying to get ourselves like 34 on the ACT?” The parent agrees. “OK,” the parent says. She later sent Singer a sample of her son’s handwriting. Singer will plead guilty to racketeering conspiracy, money laundering conspiracy, conspiracy to defraud the United States and obstruction of justice. Stanford University sailing coach John Vandemoer will also plead guilty Tuesday. No students have been charged, and authorities said many children didn’t know about their parents’ activities. Investigators said they learned about the alleged scam from a witness in an unrelated investigation. They added that the universities for the most part didn’t know about Singer’s operation. The indicted coaches were head and assistant coaches in sports including tennis, soccer, sailing, water polo and volleyball. Tuesday afternoon, Stanford said it had fired Vandemoer, and Wake Forest University said it suspended head volleyball coach Bill Ferguson.